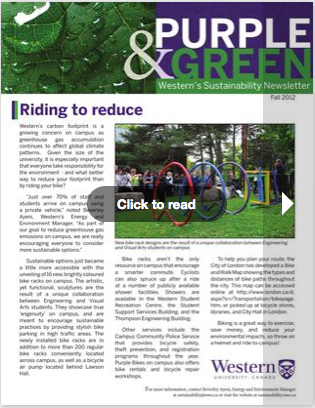 Western has published its first sustainability newsletter, Purple & Green. The online publication reflects both the spirit of Western and our relationship with the environment. The newsletter will be published quarterly and include seasonal information, covering the events and activities from students, staff, and faculty perspectives. Everyone is encouraged to submit articles related to sustainability for the next edition by emailing sustainability@uwo.ca. The current edition of 'Purple & Green’ can be viewed here. Subsequent editions of 'Purple & Green’ will be accessible through the 'About Us' section of the website.